My post a couple of days ago announcing that, with Ella stepping down, I had decided to close SL Naturist has resulted in me creating something of a considerable s***storm for myself. I’ve been in SL for quite a long time now, frequented a lot of naturist sims and therefore have a lot of SL naturist friends. Ella remains adamant that she wishes to quit the position of SLN editor, and hers are considerable mesh flip flops to fill. I’ve taken for granted that the posts would be there, that Ella & Pookes would post, that the standard of writing would be good. Faced with that void, why continue? Can we get someone as committed? Can we get someone with the same standard of English? Can we get someone with the same knowledge of RL & SL naturism? Probably not. But some of you seem to believe that’s no excuse not to try. I’ve already outlined my thoughts of this, that it’s best we go out on top, but some people obviously disagree. I am making no promises about this. People may not fit the bill. I may decide to still follow my first instinct and close, as planned, on September 14th. As several people have said no, please don’t, and others have expressed a desire to try to fill an Ella-shaped void, I owe it to you to maybe try to see if there’s a suitable replacement out there. The fat lady may not be singing just yet, but my own view is that she’s sipping a honey & lemon drink and practicing some scales backstage. 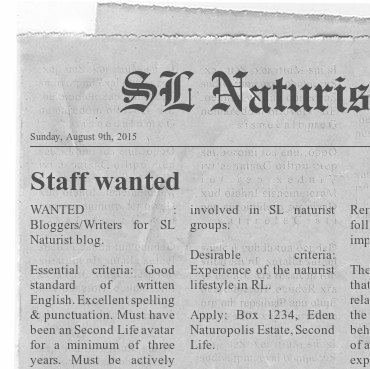 This entry was tagged SL, SL Naturist. Bookmark the permalink.